During installation, basic GroupWise configuration information is imported into GroupWise Mobile Server. 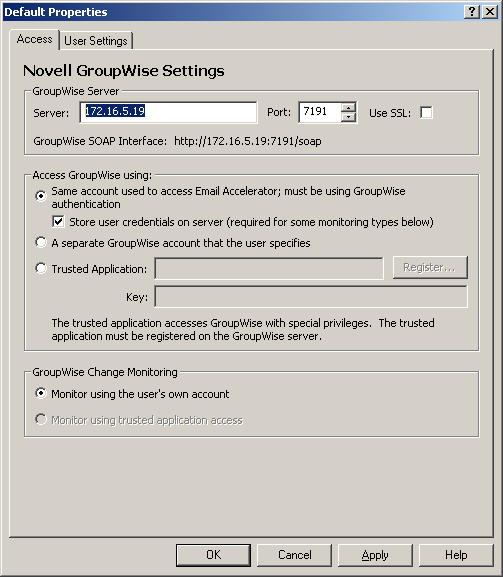 In the Admin Console, expand Profile Settings > Email Accelerator > Novell GroupWise. Right-click Default, then click Properties to display the Access page. 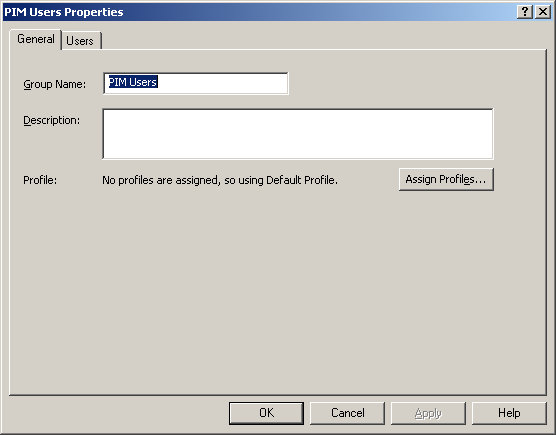 The steps in this procedure guide you through creating the default profile for GroupWise. If you have groups of users that you want to have settings different from the default, you can repeat this procedure multiple times, as described in Section 4.4.4, Creating Multiple Profiles. Change access settings as needed. Click Apply to save the access settings for the default profile, then continue with Configuring User Options. 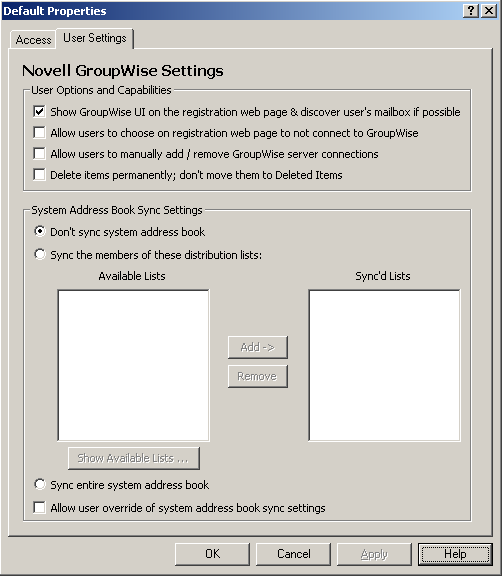 Continuing under Profile Settings > Email Accelerator > Novell GroupWise > Default, click the User Settings tab. In the User Options and Capabilities box, select the first three options, then click Apply to save the user options for the default profile. Continue with Configuring GroupWise Address Book Synchronization. 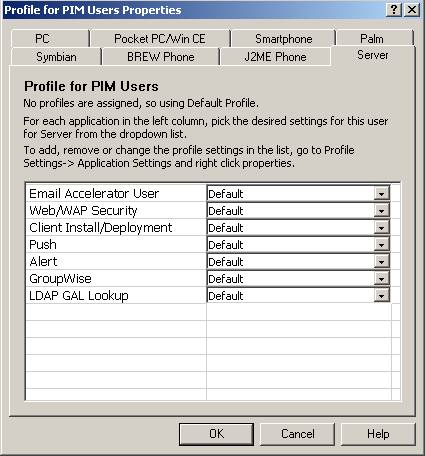 In the System Address Book Sync Settings box on the User Settings tab, select how you want to synchronize the GroupWise Address Book to the GroupWise Mobile Server Web PIM, where users select the GroupWise PIM data that will be synchronized to their mobile devices. NOTE:In GroupWise Mobile Server, the GroupWise Address Book is referred to as the “system address book” or the “global address list”. If you do not to synchronize the full GroupWise Address Book to the Web PIM, select Don’t Sync System Address Book. In the Web PIM, users can still select the personal address book to which their Contacts folder is mapped. Typically, this is the Frequent Contacts address book. Users can map a different address book to the Contacts folder if they would prefer a different personal address book rather than the Frequent Contacts address book. For more information, see Section 6.3, Using the Web PIM to Configure Device Synchronization Settings. Select Sync the Members of These Distribution Lists. Specify a valid GroupWise username and password so that GroupWise Mobile Server can log into the post office and retrieve a list of available distribution lists. Select distribution lists in the Available List, then click Add to move them to the Sync’d List. 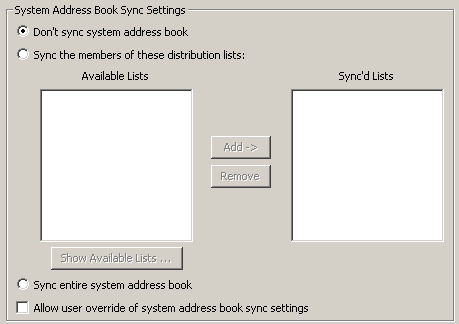 If you want to synchronize the full GroupWise Address Book to the Web PIM, select Sync Entire System Address Book. If you want users to be able to override your synchronization setting when they use the Web PIM, select Allow User Override of System Address Book Sync Settings. Click OK to save the address book synchronization settings for the default profile. If you have just created a custom profile, return to Step 4 in Creating Multiple Profiles. Under Profile Settings > Email Accelerator, right-click Novell GroupWise, then click Create New Setting. In the New Setting Name field, specify a meaningful name for the customized profile, then click OK. This can be any name you want. For example, if you want them to access a different POA, you might want to include the name of the post office that the POA services. Return to Step 3 in Section 4.4.1, Viewing Initial Configuration Information to create the profile of customized settings, then return to this point. Click Users or Groups, then select the users or groups that you want to assign the profile to. Right-click the selected users or groups, then click Properties. This example shows the properties of a group. Click Assign Profiles, then click the Server tab. In the Email Accelerator User drop-down list, select the customized profile that you just created, then click OK to assign that profile to the selected group. Repeat Step 4.b through Step 4.e to assign other custom profiles to other users and groups.